Most cities probably have at least one personal injury lawyer who is recognized by the public simply from the attorney’s extensive TV advertisements promoting the lawyer’s legal services. 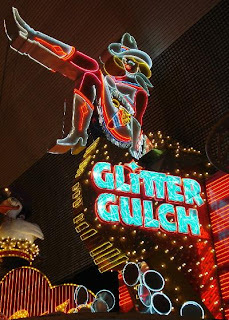 In Las Vegas, that attorney is Glen Lerner. Lerner, who established his practice in Nevada in 1991, is well recognized for his somewhat cheesy low-budget TV commercials advertising his personal injury legal services which have been gracing the Las Vegas airways for many years and have made him a mini-celebrity here (I suspect that he keeps his ads intentionally cheesy at this point because while he can certainly afford more polished ads, the cheesiness of his commercials have become another one of his signatures). You can check out some of his greatest hits on YouTube (here as well as his famous Super Bowl – pardon me, “Big Game” ad here. 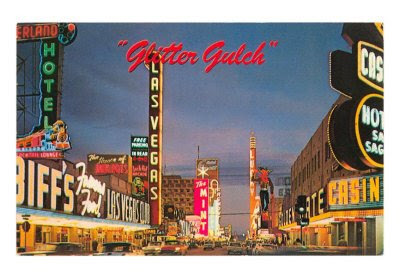 But if you ask Las Vegas locals to describe Lerner in 3 words or less, most likely you will hear them refer to Lerner as “The Heavy Hitter.” Sometime in 2001, Lerner began promoting himself as “The Heavy Hitter.” While the ad campaign certainly grabbed the attention of the Las Vegas public, it also got the attention of the State Bar of Nevada, who told Lerner that calling himself “The” Heavy Hitter was false and misleading because it’s a statement that he is the only heavy hitter. Instead, the Nevada Bar told Lerner that he could only be “a” heavy hitter. Click here for a Las Vegas Review Journal article on the “heavy hitter” dispute between Lerner and the State Bar of Nevada. 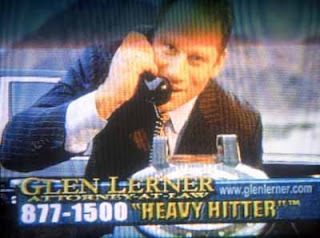 Now Lerner finds himself in the midst of another dispute over the “heavy hitter” moniker – but this time it’s a trademark dispute with a company with which Lerner (apparently up until recently) had a licensing arrangement to use the name HEAVY HITTER. Lerner has apparently refused to pay the agreed-upon licensing fee and is now challenging the company’s trademark rights in court. On August 22, 2008, Lerner filed a declaratory judgment action against Richard Sackett, LawCo USA, PLLC (“LawCo”), and Group Matrix, Inc. (“Group Matrix”) (collectively, the “Defendants”) in the U.S. District Court for the District of Nevada. See Lerner v. Sackett et al, Case No. 08-cv-01123 (D. Nev.). A copy of the complaint can be downloaded here. According to the complaint, LawCo and Group Matrix are both advertising agencies purportedly owned and operated by Sackett. LawCo is the named registrant of the registered trademark HEAVY HITTERS for legal services, which it filed on April 3, 2001 as an intent-to-use application and registered on February 1, 2005. Several months after this first application was filed, Sackett himself on August 22, 2001 filed an intent-to-use trademark application for the mark HEAVY HITTERS for advertising, management, and marketing of legal services (later amended to business management, marketing, and advertising services specifically for the legal services of others). The application has been allowed, but no Statement of Use has yet been filed by Sackett. At first, without knowing anything about LawCo or Sackett, one might think that the two applications and applicants were completely unrelated. Indeed, the attorney of record for Sackett’s application in the Office Action Response filed June 11, 2002 had to argue no likelihood of confusion in response to the PTO’s citation to LawCo’s then pending application. But after the PTO maintained its likelihood of confusion rejection over LawCo’s HEAVY HITTERS mark after it registered, Sackett’s counsel submitted a Declaration stating that Sackett is the “general manager and controls the activities of LawCo USA, P.L.L.C. Corporation.” As such, this makes LawCo and Sackett “related entities” and therefore, the PTO withdrew the likelihood of confusion rejection. 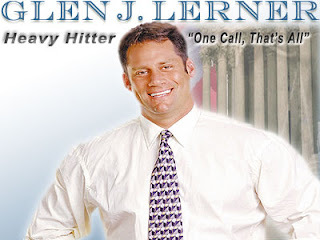 Lerner’s lawsuit seeks a declaratory judgment that his use of the HEAVY HITTER and HEAVY HITTERS marks for legal services does not infringe Defendants’ trademark rights in its Heavy Hitter Marks. According to Lerner’s complaint, sometime in 2002, Lerner entered into some kind of license agreement with the Defendants to allow Lerner to use the mark HEAVY HITTER in the advertising and promotion of Lerner’s legal practice. [Note: The complaint states that Lerner “attempted” to enter into an agreement, but other parts of the complaint, notably those asking for the agreement to be rescinded, suggest that an actual agreement was indeed entered into by the parties.] At the time, the Defendants claimed trademark rights to the marks HEAVY HITTER and HEAVY HITTERS for use in connection with legal services was based on the above trademark applications. The Defendants have apparently entered into other license agreements with other third party legal service providers to use its Heavy Hitter Marks. Lerner argues that the Defendants fraudulently induced him to enter into the agreement based upon a misrepresentation that Defendants held legitimate trademark rights in the Heavy Hitter Marks. [Comment—An intent-to-use application by an applicant with a bona fide intent to use the mark does provide the applicant with legitimate inchoate trademark rights]. Lerner further argues that the Defendants do not provide legal services in connection with the Heavy Hitter Marks nor can they provide such services because they are not licensed attorneys capable of providing legal services. [Comment—“legal services” is a pretty broad category and doesn’t necessarily mean the “practice of law” and Defendants controlled license of the marks constitutes use]. Lerner also claims that Defendants lost their trademark rights by not exercising any quality control over Lerner’s legal services or over any legal services offered by another other third party licensees of the Heavy Hitter Marks. [Comment—My favorite defense – the “naked license”]. Lerner apparently received a cease and desist letter from the Defendants on or around August 14, 2008, threatening suit if he did not stop using the Heavy Hitter Marks, thereby leading to Lerner’s reasonable apprehension that Defendants will file legal action against him and the basis for his seeking declaratory relief. Based on Defendants’ fraud and naked license, Lerner argues that Defendants have no trademark rights in the Heavy Hitter Marks and thus his use of the marks HEAVY HITTER and HEAVY HITTERS cannot constitute federal or state trademark infringement or unfair competition. Lerner seeks a declaration that his use of the mark HEAVY HITTER or HEAVY HITTERS does not infringe Defendant’s registered trademark, is not likely to cause confusion as to source, origin or affiliation or otherwise constitute unfair competition with Defendants trademark rights, and does not constitute trademark infringement or unfair competition under Nevada state law. Finally, Lerner throws in a claim of common law fraud based on Defendants’ false representation that the Defendants had legitimate rights to the Heavy Hitter Marks, knowledge that its representation was false (i.e., Defendants knew that they were not offering legal services in connection with the Heavy Hitter Marks or were not exercising any quality control over any licensees of such marks), and detrimental reliance on the part of Lerner with respect to those false representations (but for the false representation, he would not have entered into the license agreement with the Defendants). Lerner requests that the “agreement” be rescinded by the court, and thus, Lerner’s use of the Heavy Hitter or Heavy Hitters mark could not be a breach of contract. The prosecution history of the registered trademark application for HEAVY HITTER would give any reasonable person grounds for questioning the legitimacy of the trademark rights thereunder. After filing the application as an intent-to-use application on April 3, 2001, the application sailed through and received a Notice of Allowance on March 5, 2002. 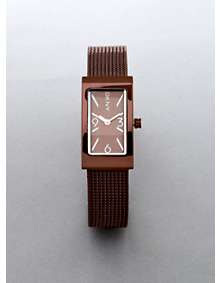 All LawCo had to do was file a Statement of Use or Extension of Time within six months. But for reasons unknown, the due date (September 5, 2002) passed. On October 10, 2002, LawCo filed the Extension Request along with a Petition to Revive the application (having missed the due date for filing such Extension Request). After the Extension Request was granted, LawCo had until March 5, 2003 to file a Statement of Use or additional Extension Request. So what happened? The due date once again came and went without any timely filing. On March 27, 2003, the applicant once again filed the Extension Request that should have been filed along with a second Petition to Revive. This extended the time for LawCo to file a Statement of Use or additional Extension Request to September 5, 2003. Because the drawing of the mark submitted with the application is for HEAVY HITTERS and the specimen showed “Call The Heavy Hitters!” the PTO rejected the specimen and demanded a substitute specimen showing the mark as depicted in the drawing. In response, LawCo apparently provided a CD of “‘Heavy Hitter’ commercials” that were in use prior to the date the Statement of Use was filed and argued that they reflected use of the “HEAVY HITTERS” mark as an “attention-getting symbol” which would be recognized as a service mark. Well, based on the PTO’s final action in response to the CD, the ads apparently showed the mark HEAVY HITTER and THE HEAVY HITTER [Ed.-Hmmm, I wonder whose ads those were?] which still differed from the original drawing of the mark HEAVY HITTERS submitted with the application. The Examining Attorney allowed LawCo to amend the drawing to HEAVY HITTER so that it conformed to the specimen (apparently not finding such a change to be a material alteration of the essence or character of the mark). And with that, LawCo finally got its service mark registration. As questionable as the prosecution of the application appears to be, there may not be enough of a false statement of material fact in the Statement of Use to kill the registration on the basis of fraud (the stated dates of use, while certainly questionable, will not be deemed material so long as the mark was used in connection with the services as of the date the Statement of Use was filed). Lerner could try to argue that the Defendants never had a bona fide intent to use the mark in commerce, but that may be difficult given the licensing arrangement entered into between the Defendants and Lerner in 2002. As for abandonment, ownership rights in a trademark or service mark may be acquired and maintained through the use of the mark by a controlled licensee even when the only use of the mark has been made, and is being made, by the licensee. See Turner v. HMH Publishing Co., Inc., 380 F.2d 224, 229, 154 USPQ 330, 334 (5th Cir. 1967), cert. denied, 389 U.S. 1006, 156 USPQ 720 (1967). Of course, the key word in the above is “controlled” licensee, which comes back to what may be the best argument for Lerner’s abandonment defense -- the apparent “naked license.” If Lerner can show evidence that Defendants have not, nor have they ever, taken any reasonable steps to monitor the quality of the services rendered by Lerner and other licensees, then such failure to ensure quality control can result in the trademark ceasing to function as a symbol of quality and a controlled source in which case the trademark will be deemed to have been abandoned and the Defendants would be estopped from asserting rights to the mark. 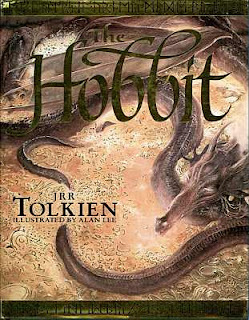 For what it’s worth, when I think of the “Heavy Hitter,” only one “source” comes to mind. Lydia King Rayner began operating Urgent Care, Inc. in Mississippi in 1985 and registered the name “Urgent Care, Inc” as a servicemark with the Mississippi Secretary of State in 2001, but not with the United States Patent and Trademark Office (“USPTO”). Rayner later formed “Urgicare, Inc” and registered the mark mark “UrgiCare” with both the Mississippi Secretary of State and the USPTO. Rayner filed suit against two companies that started up medical clinics using the name Urgent Care (Apple Urgent Care Occupational Clinic and South Mississippi Urgent Care, Inc.) claiming infringement of the above state and federal registrations. The district court granted Rayner’s Motion for Preliminary Injunction against South Mississippi Urgent Care after determining that Rayner had established the required elements for preliminary injunctive relief, including substantial likelihood of success on the merits due to a likelihood of confusion between each of the parties’ marks and implicitly finding that the marks were protectable in the first place (i.e., not generic and that they had acquired a secondary meaning if descriptive). In finding that the the district court had erred in its determination, the Court analyzed each of the marks at issue. With respect to the mark “Urgent Care,” the Court of Appeals concluded that the term had not become distinctive of Rayner’s goods and indeed was generic and therefore not entitled to any trademark protection. The court focused on the number of other medical providers that have adopted the word “Urgent Care” in their name as well as a definition of “Urgent Care Medicine” by the American Academy of Urgent Care Medicine. Such extensive use by others shows that others are equally entitled to use such nondistintive words to identify their own services. Finding the “Urgent Care” mark to be generic, the Court of Appeals found the district court’s injunction to be in error and an abuse of discretion. As for Rayner’s other claimed mark for “UrgiCare,” Rayner’s argument for likelihood of confusion was that because “UrgiCare” sounds like the phrase “urgent care,” the use of the phrase “urgent care” infringed the “UrgiCare” mark. Having found the term “Urgent Care” to be generic, the Court rejected this argument stating that Raynor cannot prevent companies from using a generic term by obtaining a registration on a similar-sounding, but differently spelled mark. The Court further found that “South Mississippi Urgent Care” is sufficiently distinct from UrgiCare that Rayner’s trademark rights were not infringed. As such, the Court reversed the district court’s preliminary injunction with respect to the “UrgiCare” mark as well. The news outlets were abuzz today about the trademark infringement lawsuit filed by California cupcake maker Sprinkles Cupcakes against rival cupcake maker Famous Cupcakes (Reuters news report here). The lawsuit, filed on Thursday, claims that Famous has appropriated Sprinkles’ signature “nested circle design” trademark into its packaging, store décor, and website. 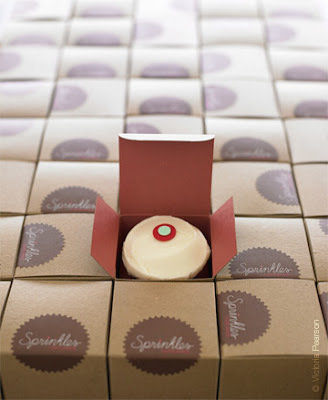 Sprinkles sells a wide variety of cupcakes each of which are topped with a signature dot that functions as an indication of the particular flavor of the cupcake. Sprinkles’ flavor card showing which dots correspond with which flavor can be viewed here. However, Sprinkles was able to overcome the PTO’s two refusals to register the design on the Principal Register (a non-distinct configuration refusal and an ornamental refusal) by changing the basis of the application to Section 2(f) and providing evidence that the mark had acquired distinctiveness (i.e., customers had come to associate the dot design with Sprinkles). Sprinkles’ "nested circle design" for "bakery goods" was registered April 3, 2007. 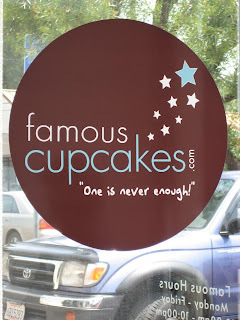 While a quick view of Famous’ website didn’t reveal any particular appropriation of Sprinkles’ “dots” that I could see, Famous, which has its own unique group of flavors (here), does offer its customers the choice of various “toppers” on their cupcake. Is Sprinkles claiming that no other cupcake makers can put any kind of candy heart or other design in the center of a cupcake? On August 8, 2008, Jimmy Daniel Alexander, a member of the rock band “Rehab,” filed a trademark infringement lawsuit in the U.S. District Court for the District of Nevada against the owners of the Hard Rock Hotel & Casino (“Hard Rock”) in Las Vegas. See Alexander v. Hard Rock Hotel, Inc. et al, Case No. 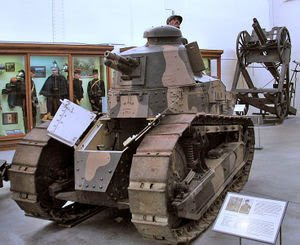 08-cv-01035 (D. Nev). A copy of the complaint can be downloaded here. According to the complaint, Alexander, along with two other musicians, formed “Rehab” in the late 1990s in Atlanta, Georgia (see also Wikipedia write-up). The band has released 5 albums to date (its major label debut “Southern Discomfort” was released in 2000 and sold over 170,000 albums). The band even played in Las Vegas as recently as August 5, 2008 (The Las Vegas Weekly here even noted that "It's not Hard Rock's Rehab but they do rock hard"). Alexander also currently owns a federal trademark registration for the mark REHAB for music (August 31, 1999 first use date) and clothing (September 2000 first use date) which he acquired by assignment from Destiny Music, Inc. on January 31, 2005. 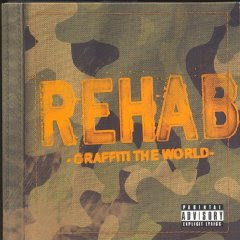 You can see the “Rehab” clothing line here. Alexander also has an application pending for the mark REHAB for live performances by a musical band. Sometime in 2004, the Hard Rock began hosting Sunday afternoon pool parties under the name “Rehab.” (For those with high-speed modems, click here to check out the Hard Rock’s interactive view into the world of “Rehab” – complete with its own “movie trailer”). The Hard Rock, through its IP Holding company, HRHH IP, LLC, also holds its own trademark registrations for the design marks REHAB RX and REHAB RX SUNDAYS AT THE POOL -- both for "seasonal poolside party held weekly with food, drinks and entertainment" with first use dates of April 5, 2004. In addition to hosting these parties, the Hard Rock also sells clothing (t-shirts, hats, etc.) ornamentally displaying its Rehab marks. According to the complaint, sometime in March 2006, a fan of the band “Rehab” forwarded a photo of Britney Spears wearing a “Rehab” shirt thinking that it was referring to the band, but in actuality it was a shirt from the Hard Rock’s “Rehab” party. Possibly the photo that sparked it all? On April 7, 2006, Alexander’s attorney at the time contacted the Hard Rock's legal counsel regarding its “infringing use” of Alexander’s REHAB mark. Hard Rock's counsel supposedly told Alexander’s attorney that all infringing merchandise had been removed and offered a $7500 settlement (claiming that the Hard Rock had never grossed more than $13,000 from the sale of such merchandise). The attorneys supposedly reached an agreement on the terms of a settlement involving a $10,000 payment along with an agreement for the Hard Rock to sell Alexander’s “Rehab” merchandise through the Hard Rock’s retail outlet, but the agreement had to be approved by the Hard Rock. This settlement, however, was apparently never approved and finalized before the Hard Rock was sold to Morgan Hotel Group in 2007. Afterwards, Alexander's attorney was put in touch with Mr. Phillip Shahala, the newly appointed Vice President of Marketing, and the two came to some kind of “agreement” through a series of e-mails whereby Alexander would allow the Hard Rock to continue to use the name “Rehab” in exchange for a $13,000 payment to Alexander, a percentage of all clothing sales from the Hard Rock “Rehab” pool parties, space for Alexander’s “Rehab” clothing to be sold at the retail store located at the Hard Rock, and a promise to schedule 3 performances for the band to play at the Hard Rock’s concert venues. It is not clear from the complaint whether an agreement was actually reached (and subsequently breached) by the Hard Rock or whether the parties were still in the negotiation phase. While Alexander claims to have acted pursuant to the terms of this “settlement agreement” with Shahala by not pursuing any action to stop the Hard Rock from using the “Rehab” name, it appears that Alexander was never paid the $13,000 nor was there any final written agreement memorializing the terms of any such settlement. [Ed. – Wouldn’t you have been a little suspicious when the Hard Rock didn’t at least pay the $13,000? Is there really an enforceable settlement agreement here if there are only e-mail exchanges negotiating terms of a settlement? Did Shahala have authority to enter into such an agreement? And why didn't Shahala turn the matter over to Hard Rock's legal counsel?] The Hard Rock apparently broke off contact with Alexander and did not take any actions consistent with the supposed terms of settlement. Alexander claims that the Hard Rock’s use of its “Rehab” mark is likely to cause confusion with its own REHAB mark. 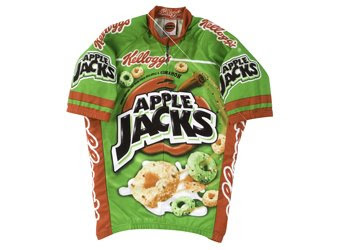 Alexander’s causes of action are for registered trademark infringement (15 U.S.C. § 1114), federal unfair competition (15 U.S.C. § 1125(a)), common law trademark infringement, breach of contract, and unjust enrichment. Alexander seeks an injunction to stop the Hard Rock from using the name “Rehab” (and the request is not limited to just the use on clothing but appears to cover use by the Hard Rock of the name "Rehab" for pool parties as well). Alexander also seeks an accounting of Hard Rock’s profits from any infringement [Query—profits just from the sale of clothing or from the pool parties as well, which is where the real money is likely to be] as well as damages for the “breach” of the settlement agreement, which Alexander values at in excess of $1,000,000 because of the promotional value to the band of the promised concert appearances. With all of the talk these days about celebrities going to “rehab,” I don’t think the mark, at least with respect to clothing goods, is especially strong given that the word "rehab" is well recognized to be short for "rehabilition." 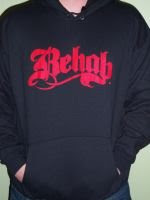 In addition, the word “Rehab” appears on the clothing as more of an ornamental feature and not necessarily functioning as a source identifier and it's arguable whether it would even be recognized by consumers as an indicator of secondary source or sponsorship (i.e., recognizing “Rehab” to be a reference to the band “Rehab”) although the PTO was apparently satisfied with the specimens submitted with the application and even with the most recent Statement of Use filed in 2007. The primary goods/services at issue (pool party entertainment versus rock band music CDs) are different enough that it will probably be enough for Hard Rock to prevail on a likelihood of confusion analysis. After all, the PTO didn't seem to find the marks to be confusingly similar. 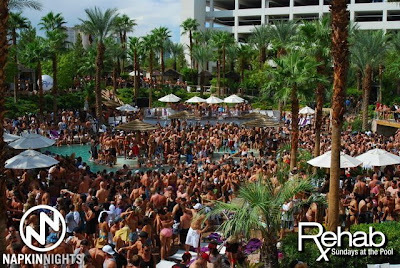 The Hard Rock's use of the term "rehab" is most likely to be recognized as a suggestive play on "rehabilitation" (i.e., going to the Hard Rock's pool party is like going to rehab) and not likely to be recognized as the official pool party of the band Rehab. But then again, Alexander could play up the rock & roll connection between his band and the Hard Rock. As for the Hard Rock’s sale of clothing bearing the Hard Rock’s own “Rehab” mark, this may be more of a challenge for the Hard Rock given the similarity of the marks, similarity of the goods, similar marketing channels, low degree of consumer care regarding purchases of clothing, and evidence of actual confusion (however weak), all of which tend to favor Alexander. Of course, given that the Hard Rock's use of the word “Rehab” on clothing is likely to be recognized more as ornamental or as an indicator of secondary source or sponsorship and not as a trademark for such clothing, the Hard Rock may end up having to rely on a more fundamental argument that its use of the word "Rehab" on its clothing does not even constitute "use in commerce" under the Lanham Act. See 15 U.S.C. § 1127. H&R Block last week filed a trademark infringement lawsuit against American Express over its trademark “I got people.” News stories here and here. H&R Block points to what it calls its “My people” ad campaign where customers are depicted relying on H&R Block’s “people” to handle not just their taxes but other routine personal assistant tasks. H&R Block claims that its extensive radio and TV ads, print ads, billboards and online ads have made the public come to identify the phrase “I got people” with H&R Block. H&R Block’s causes of action are for trademark infringement, unfair competition, and trademark dilution. It is somewhat coincidental that the American Express ad first ran on April 28th – thirteen days after H&R BLOCK obtained a federal trademark registration for the mark I GOT PEOPLE (for tax preparation services for others). H&R Block is also seeking to register WE'VE GOT PEOPLE, I'VE GOT PEOPLE, and YOU'VE GOT PEOPLE for similar services. However, as “famous” as H&R Block may think its slogan has become (I have a vague recollection of seeing one TV commercial), I doubt that anyone is likely to believe that there is an affiliate or connection between H&R Block’s “I Got People” tax preparation services and American Express’ use of the “people” phrase to advertise its credit card services (where the reference to people is used in a comical manner to allude to the idea that all Hollywood celebrities have “people” to handle their affairs and not necessarily as a source identifier). 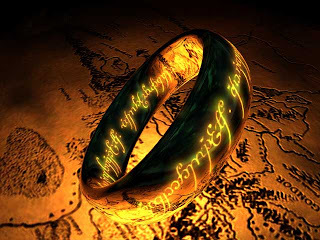 Two for Tuesday: Check out Michael Atkins’ Seattle Trademark Lawyer blog post here reminding the public of how trademarks, when used properly, emphasize a particular company’s proprietary “brand” and not a common word that stands for a type of good. I often tell clients that one way to tell if a word serves as a trademark or service mark is to incorporate the word “brand” followed by the common word for a good or service. Of course, the advice works better for 1 to 2 word marks and less so for slogans (as noted below by anonymous). After all, will you be using H&R Block’s I GOT PEOPLE brand of tax preparation services next year?